Falling in love was effortless, magical. I wasn’t looking for it, and there I was, quickly falling deeper and deeper in love. It was like nothing I had experienced before. I felt totally seen, heard, loved down to my very soul. I lost myself in that love. I gave everything I had. It was the most beautiful thing that I had ever experienced, and it also turned out to be the most painful. There were many warning signs from the very beginning, but the connection felt so incredibly good that I really didn’t care. It wasn’t long before those issues I had ignored started cropping up to the surface. And as that happened I started realising that I had deeper desires that I hadn’t acknowledged because I was so lost in the endorphins-fuelled ecstasy. I wanted more, but he wanted something else. There was a point when I realised with a sinking feeling that this was not going to work, but I quickly brushed it aside. The idea of giving up something that felt so good was mildly panic inducing. And so I stayed, negotiating, compromising, getting hurt. I was lost so deep in this love that I kept allowing myself to get hurt over and over. What kept me going was the knowing that he loved me so much and that the love we had was so real and beautiful that we had to save it no matter what. So I ended up compromising myself, compromising my sanity and wellbeing for this relationship to continue at any cost. I started having more and more meltdowns, questioning myself, bending over backwards just to keep it going longer. And in the meantime he was not willing to compromise. He knew that what he was doing was hurting me immensely, but he was putting himself first. It took me a long time to realise that’s what I should be doing too. It may take a while, but there comes a point when you want to stop hurting yourself. There comes a point when you say “Enough”. Enough compromising, enough pretending it’s okay when it’s not, enough obsessing and rose-coloured dreams that will never become reality. It’s the point when you say, “I know you love me, but what you’re doing is hurting me beyond belief, and it has to stop. It’s not healthy for me. I know that you don’t mean to hurt me, but I am human, and turns out these things I am not okay with.” This is the turnaround point. It’s the point when you say, “I love you, but I love me more”. That was the starting point in my recovery. I started recovering the lost pieces of myself, holding myself with love and putting myself first. This is the point when I started loving myself and setting boundaries. Boundaries are important. They help you and the people in your life understand what’s acceptable for you and what isn’t. Most people hurt you unwittingly, without really meaning to. Some just hurt you inadvertently, by doing what they feel is right for them. It doesn’t make them bad people. They may still love you with all their heart. It’s just that this part of their behaviour is not okay with you. That’s where you stop and draw the line. You set your boundaries, however painful that may be for you. And if the only solution is to discontinue the relationship, then you have to do that for your own sanity. As women we have a tendency to be accommodating and put others first. We have a tendency to give everything we have and sometimes attempt to give even more than that. It is beautiful to give, but only when we have filled ourselves up first, when we don’t compromise our values in the process. We also have a tendency to settle for less than what we deserve – less respect, less commitment, less significance. The reason we do that is because we are not sure if we even deserve these things. Are we asking for too much? Are we being unreasonable? How do you know that you deserve something? Well, here’s a way to find out. Do you want it? Yes? Then you absolutely deserve it. You don’t have to earn it, you don’t have to be anything special. You deserve it by the fact of wanting it. Setting boundaries can be painful, but it clarifies what you want and don’t want, what is right for you. It’s the beginning of a healthy relationship with yourself where other people respect your desires. It may not be an easy process at first. It takes a lot of guts, courage and support from loving people. But it is a crucial part of growing up and asserting your right to be treated the way you want to be treated. 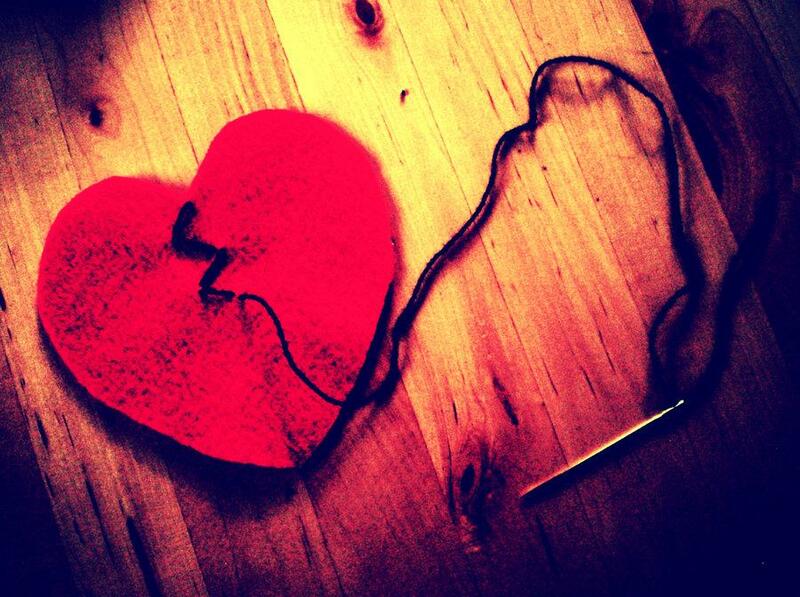 My heart was shattered to pieces, and it was a slow and painstaking process to start putting the pieces together again. But in the process I learned something invaluable – how to love myself and put myself first; how to respect my desires and my boundaries; how to be strong for myself and hold my own bleeding heart while it heals. The more I practice self-love and self-care on a daily basis the stronger I start to feel on the inside. I treasure my heart, my energy and my desires. I am a lot clearer on what I want and deserve in relationships. And as I go forward I know that I will only attract those who are in alignment with these new values.